Most of the time, these promises turn out to be false, but every now and then, a tiny hand-held gadget comes along that offers to break the “too good to be true” mantra! You’ve seen it on TV and wonder, “Does it really do all that?” They claim it’s the best vegetable spiralizer. In this Veggetti review​ we will look at two Veggetti models, the standard and the pro version. Is The Veggetti Worth It? Anyone who suffers from gluten intolerance or diseases such as Crohn’s or Celiac Disease often find themselves having to forego old favorites such as pasta and some of the best summer side dishes, because the pasta replacements tend to be very expensive. There are only so many ways that vegetables can be cut, cooked and presented if you don’t have a Red Seal certificate on your kitchen wall; the Veggetti could change all that! If I sound excited, it’s because I am. I have known people who are unable to eat regular pasta because of these conditions and I am thrilled to have come across this unique kitchen gadget that can spiralize vegetables like spaghetti. The original Veggetti is a compact, hand held unit compared to the Pro version. The concept is simple: simply insert your vegetable of choice into the device and twist it. The noodles will emerge from the side of the Veggetti to drop neatly into your bowl, ready to eat raw or cook up for a delicious snack. There are two different options for your noodles – thin or thick, and you can cut the strands at any point during twisting to be as long or short as you wish. However, it will work with almost any vegetable that is 2.5-inches in diameter or smaller. Sweet potatoes are a challenge to spiralize because they are quite hard. A simple solution is to warm them in the microwave before trying to turn them in to vegetable strings. Once your veggie noodles are made, it only takes a minute to cook them. You do not need to cook them as long as you would pasta, otherwise they will become mush. Easy to wash, you can pop the entire device into the dishwasher, although it’s simple enough to wash off with a rinse – provided you don’t leave it sitting around after use for the residue to get stuck on. It’s also small enough to be popped away in a kitchen drawer. Safety wise, be careful using it with kids, as the blades are truly sharp and little, inquisitive fingers could potentially get hurt. There is an end cap that you should attach to the vegetable to protect your hand from getting too close to the blade, but it doesn’t stick into harder vegetable so well, making it easier to just use your hand. There is very little waste from this gadget and those who like to snack while cooking can enjoy nibbling on the small chunks left over by the cutter. You will end up with about 1.5 inches of vegetable. Because this model is manually operated, a cook with arthritis in his or her wrists may find it difficult to use and may prefer the Veggetti Pro. If you’re new to spiralizing and want to give it a go, or only have a small family to prepare your delicious vegetable noodles for, this is a great choice. It’s super affordable and easy for the whole family to use – just remember to supervise if small children are having a go. The Veggetti Pro is – as the name suggests – is a step up from the original; both in size and features. The concept is similar to other spiralizers on the market, where you lock your vegetable of choice into the clamp device and crank the handle to push it through the blades and squeeze out the noodles. Unlike the original, this isn’t a hand-held unit; it comes on a stand that has suction cups to hold it in place on the countertop and has three interchangeable blades. Safety-wise, it’s a step up from the original model in that you don’t have to use your hand to push the vegetable through the blades, eliminating the chances of getting cut when spiralizing. As mentioned above, the standard Veggetti is great for one or two people, but if you have a bigger family to feed, the Veggetti Pro is going to make things a lot easier. The standard version has two options for noodle sizes, and the Pro offers thick, thin, or spiral options. Although the original had minimal food wastage, the pro makes it possible to use the entire length of the vegetable, almost eliminating waste altogether. Also, because you’re not inserting the vegetable inside of the unit (as in the Original), you have many more options of vegetables to use and aren’t as limited by diameter. Having said this, many people do find it difficult to get the vegetables to stay in the clamp and also report issues with the suction feet failing to stick properly; both problems that make the device a tad more frustrating to use. The Veggetti Pro is even easier to clean than the Original, simply take it apart, give it a rinse, or throw it in the dishwasher. Even though it’s a bit bulkier than the original, it can be dismantled for compact storage when not in use. 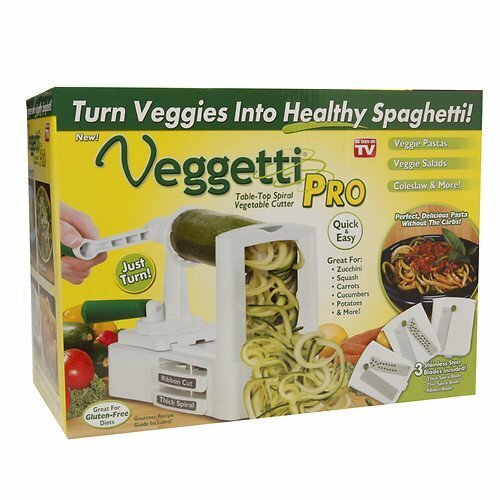 All in all, the Veggetti Pro does seem to do what it claims: create healthy noodles from various vegetables with no mess and no fuss. If you want to do a lot of spiralizing or have more options with regards to your choice of vegetables and sizes, opt for the Pro version. How does cutting your calories down without depriving yourself of delicious meals sound? For those who are vegan, for those who have wheat or gluten issues, or just for those who want a new way to present their cooked vegetables, the Veggetti Original or Veggetti Pro may be just what you need for your kitchen. Not every product that we review is worth purchasing, but this item has landed on our wish list! It’s not the highest quality spiralizer on the market, but this makes it more affordable, and it does do a great job without needing any extra bells and whistles. Eating healthy is important for everyone these days, and this little device makes it that much easier to do. I am still getting used to the Vegetti. I am one of those who is intolerant of not only wheat, but also it seems grain of any kind. 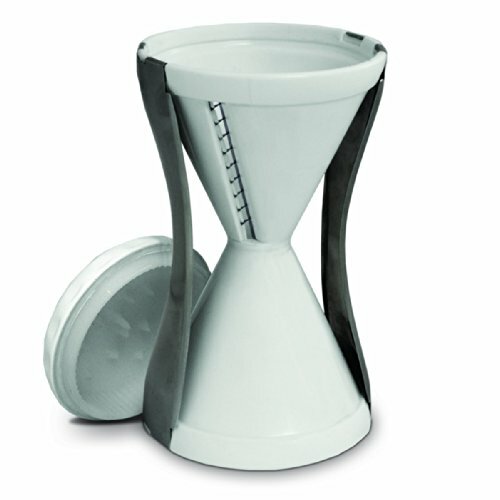 This gadget has provided a way for me to enjoy pasta-like meals with my family again! Glad to hear that you are enjoying meals with your family again! Are there any particular recipes that you love to make with your Vegetti? Loved the idea of low cal, gluten free pasta. Had some at a restaurant and then bought the Veggetti. All I can say is , Ouch! My poor fingers. I gave it to my son and his wife. We just updated our article to talk about the Veggetti Pro! This will definitely solve the issues you’ve had with your fingers! I love this small device and prefer it over my spiraler, which was marketed long before the Vegetti, Spiraler. Carefulness must be exercised. how long do you warm the sweet potatoes for in the microwave? Sweet potatoes can cook fast and will become extremely hot (Please use some sort of heat resistant gloves when handling them). If they cook too much, they won’t spiral. If they don’t heat enough, you might be tempted to use too much force and create an accident (that’s why I prefer the pro version to remove my hands from the situation as much as possible). It will depend on the size of your potato and strength of your microwave. I’ve tried microwaving for 30 seconds at a time and check to see how it spirals between each heating attempt. Unfortunately they aren’t the best vegetable for spiralizing.